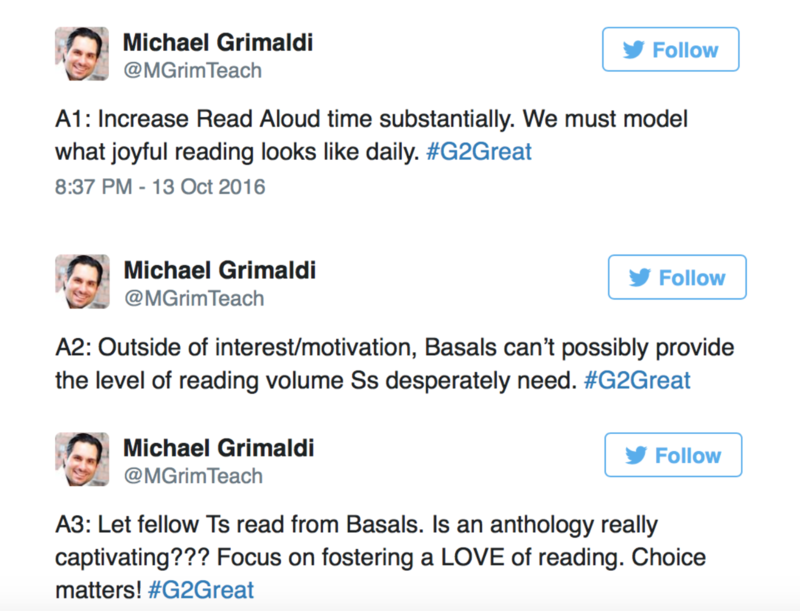 On October 13, 2016 #G2Great welcomed guest Dr. Michael Grimaldi to inspire our conversation around making a critical shift in literacy in our schools. We were inspired to have this principal join us as we watched him lead his school in the process of moving from basals to books. Turning a school around is no easy task. 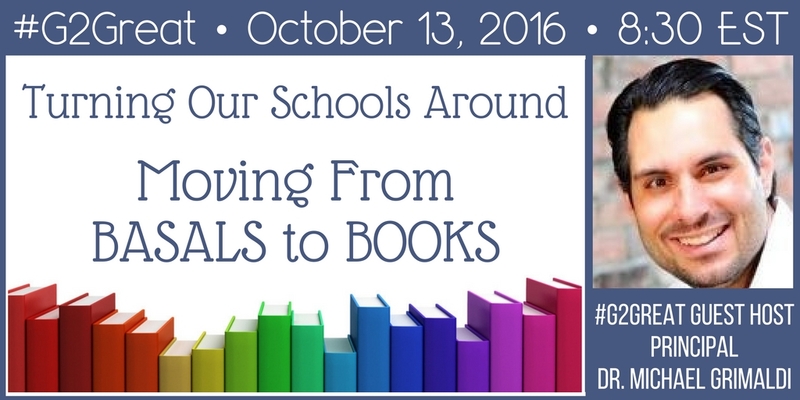 Moving a school from basals to books requires vision, passion, and support for teachers. When you have a clear vision and can articulate it to others – they want to follow. When you can explain the why behind your vision others will want to follow. Articulating the vision of providing our students with authentic literature and real world reading experiences is the beginning of the change process. Careful and intentional starts like beginning with read-aloud and building classroom libraries allows time to build the energy and opportunity for all stakeholders to watch the excitement of reading begin to build throughout a school. As teachers, administrators, parents and students begin to see and feel this energy the mental image for the vision begins to formulate in their thinking, creating a shared vision for what could be. 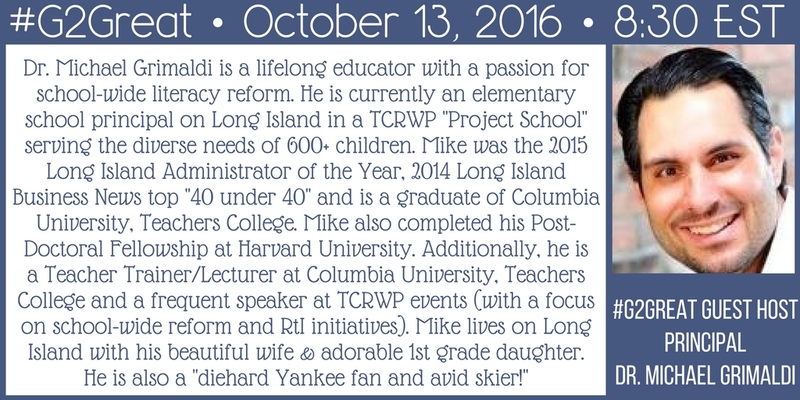 Dr. Michael Grimaldi led his school in creating not only energy and excitement around the vision, but putting the vision into action. When you read the tweets below it is clear that Michael has a vision and has shared that vision with all stakeholders in his school. People follow you and your vision when they see and believe in your passion. Once that vision is shared, the energy that is generated by the passion is contagious. The best part of that is watching kids get excited and passionate about literacy. Dr. Grimaldi’s energy is evidence of his passion. He organized efforts with Book Fairies to donate books to his school. He brought together teachers, staff developers and volunteers for books and pizza, where many hands sharing the vision organized books to be circulated into classroom libraries and directly into students’ hands for reading. Those who connect with him on Twitter, Voxer or in-person are sure to see evidence of that passion he has for leading school wide reform that will ensure that all students have access to high quality books and literacy experiences. With change and growth comes an uncomfortable feeling that signals that we are on the edge of something great. Unfortunately, that uncomfortable feeling, which can be coupled with a multitude of other demands, can leave educators feeling overwhelmed and frustrated. Without support this can spread like virus throughout a school system. Visionary leaders with passion know that when educators reach that uncomfortable place they need support more than ever because they recognize that just beyond that uncomfortable stretch is growth. To sustain this over the long term (because change takes time of course) the support needs to be ongoing. Setting up collaborative structures where teachers can share in the thinking and learning while they support each other and receive positive support from administrators is critical if change is to begin and take hold. Teacher resiliency is an important attribute that visionary leaders nurture. Developing resiliency is critical to surviving and thriving as educators. Leaders who recognize this and foster this in their educators build healthy learning organizations that continually learn and grow. Resiliency allows teachers to build capacity over time. In making the shift from basals to books teachers are building capacity throughout the shift. Teachers are thinking, growing and learning and this directly correlates to shifts in our students thinking, growing and learning. When we as educators learn, our students learn. 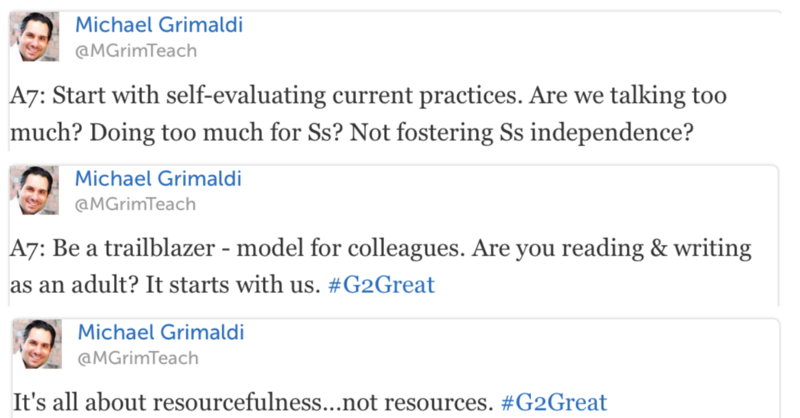 Leaders like Dr. Michael Grimaldi understand the importance of supporting teachers in way that are resourceful. Encouraging teachers to share with each other and be resourceful while making space for these practices within the school is an important piece for leaders to plan for. Being resourceful requires thinking and creativity, skills that we support in the learning process. Being resourceful requires problem-solving skills, something that was named as a top 21st-century skill for our students. Receiving resources does not translate into an increase in student learning, however being resourceful can. Educators who are resourceful model the skills of problem-solving through their actions, these are valuable to students as they prepare for college and careers. Sharing your vision and building this into a shared vision is best developed through sharing your passions as you articulate your vision while supporting teachers in the process of change. Any schoolwide efforts for change and improvement require leadership that has all three ideas that Dr. Michael Grimaldi shares with educators — vision, passion, and support. 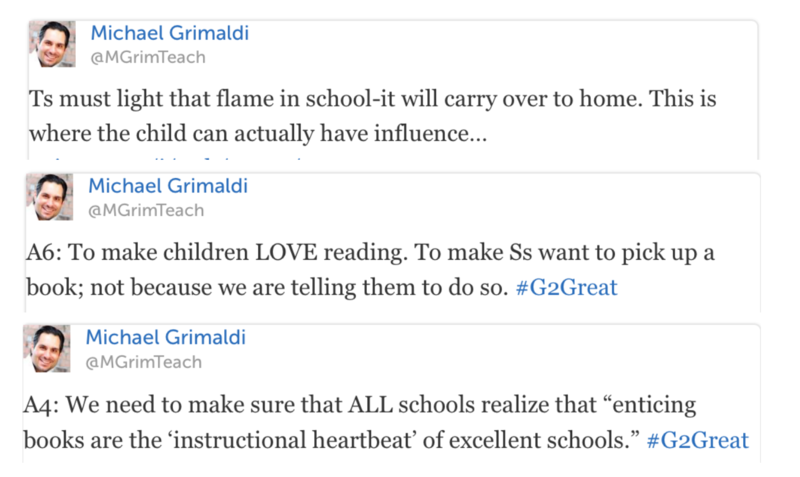 Join #G2Great and Dr. Michael Grimaldi as we act as “trailblazers” modeling our VISON and PASSION while we SUPPORT fellow educators in building resiliency that will STRETCH and GROW and we build better schools?